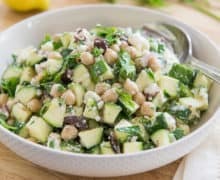 This healthy Zucchini Salad is full of fresh Greek flavors and ingredients, and is a great side for chicken, lamb, steaks, and more! Zucchini might possibly be the most versatile vegetable around. It’s one of my favorites, and you can do a thousand different things with it. In this refreshing Greek Zucchini Salad, the zucchini is enjoyed raw. I know there are people who eat raw vegetables particularly for nutrition reasons, but honestly I love the texture and flavor of raw zucchini. It’s not harsh at all, and it actually absorbs the flavors of the salad in a wonderful way. If you’ve never had zucchini like this before, try it! I think you might love it. This raw zucchini salad is particularly wonderful for picnics, potlucks, and parties in the summertime. If you need some guidance for how to cut the zucchini, here’s a post I did for How to Dice Zucchini. Let it sit in the fridge for at least one hour, to allow the zucchini to absorb the other flavors, and soften ever so slightly. I love this salad for entertaining, as it’s pretty sturdy, travels well, and tastes AWESOME as a side to chicken or fish. This Zucchini & Arugula Salad is another way to enjoy zucchini raw, in shredded form, but if you’re more keen on cooked recipes, I recommend Zucchini Fritters, Zucchini Noodle White Lasagna, and Sausage Stuffed Zucchini Boats, just to name a few of my favorites. For 60+ more zucchini recipes, scan through my Ultimate Guide to Zucchini post, which also covers how to pick good zucchini, how to store, and more. Enjoy! This refreshing and healthy Greek Zucchini Salad is a great side for Chicken, Lamb, Pan Seared Steaks, and more! Adjust seasoning as desired. Enjoy! For tips on how to pick good zucchini, how to store, etc, see my Ultimate Guide to Zucchini post. Post updated with new photos and writing in June 2018. Originally published March 2015. I really enjoyed this. Would like to try with shaved parmesan instead of feta next time. Hi Colleen, it actually keeps its firmness pretty well. I never notice any mushiness (dramatic mushiness, anyway) over the course of several days. I think the most important thing is to get very firm zucchini that you know is fresh. Enjoy! Hi Anne, that’s wonderful you were able to use your own zucchini and enjoy!